They say a hero is measured by the quality of his enemies, and the True20 Bestiary is chock full of fearsome foes to test your hero's mettle! In the pages of this book, you'll find hundreds of ready-to-use adversaries for your True20 Adventure Roleplaying games, ranging from goblins and zombies to undead, dragons, constructs, and more! * Monsters! The True20 Bestiary offers more monsters than you can shake a sword at: from classic favourites to new creatures like the angel of death, moon dragons, and the corpse-stitched abomination. With the creatures in this book, it's easy to use almost any classic fantasy adventure in conjunction with the True20 game. * Creature Types! 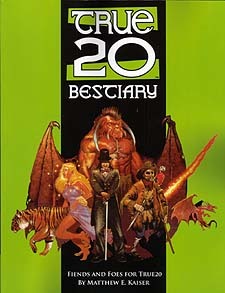 The Bestiary expands the creature types from True20 Adventure Roleplaying and also includes new science fiction creature subtypes, allowing you to use many of the creatures in this book in settings ranging from the far future to the mythic past and worlds beyond. * Templates! The Bestiary provides templates, ways of easily turning one type of creature into another. By mixing-and-matching templates and creature types, you have a near-limitless variety of foes for your game at your disposal. * Powers! Seven new supernatural powers round out the Bestiary, arming your creatures with strange new abilities, and opening up new options for adepts in your True20 game. The book also features an expanded selection of archaic weapons for use in historcal and fantasy worlds.